Today is one of those days where cooking anything beyond grilled cheese feels like a major accomplishment. But the pork is defrosted, and the show must go on! This dish is inspired by an old recipe posted by the hilarious writer Ayun Halliday. I have made some major modifications, but the spirit remains the same. I can’t remember if the kids actually ate this or not, but at this point, there is no turning back. Heat oil and saute peppers, garlic and ginger for two to three minutes. Add pork and cook until no longer pink, but do not overcook! 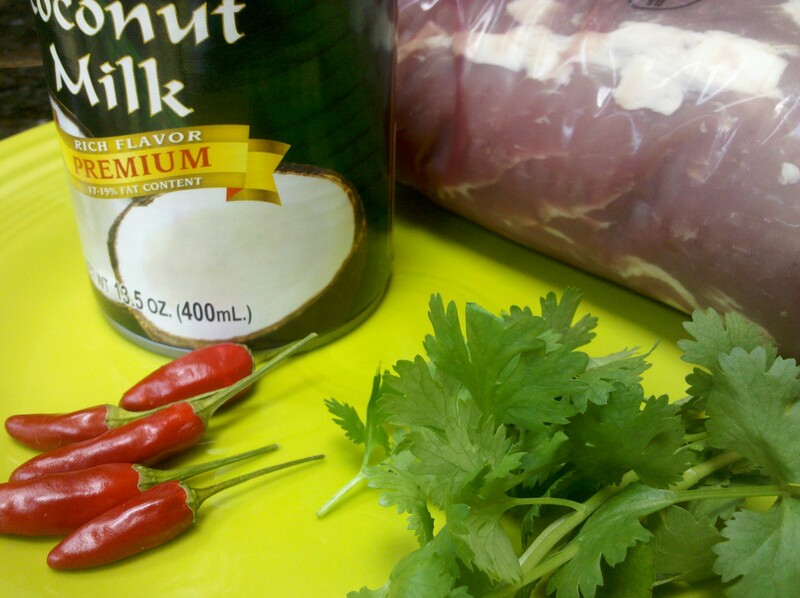 Add salt, sugar, soy sauce and coconut milk, and simmer on low for 20 to 30 minutes. Before serving, stir in a small can of Mandarin oranges. This may or may not entice your children to try it. Garnish with cilantro, and serve over rice or rice noodles. 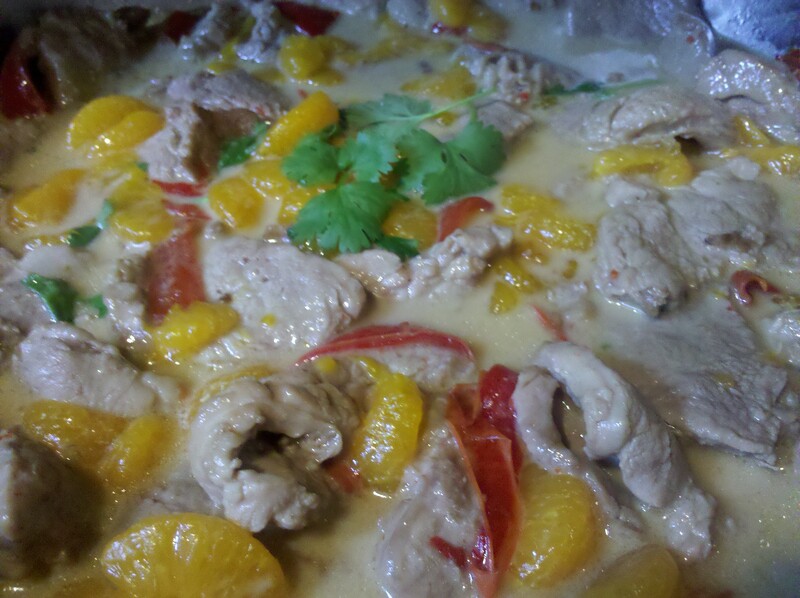 This entry was posted in Main Dish and tagged coconut, ginger, pork, spicy by Mom Mom's Apron. Bookmark the permalink. How thin do you cut it approximately? Hi Claire! I try to cut it as thin as I can, 1/4 thick or less. It helps to put the pork in the freezer for 20 to 30 minutes prior to cutting so it firms up a bit. I would have preferred it thinner last night, but it was still good. So far, all your recipes are things I would make! You have such good taste. Keep up the good work, and I can’t wait to make Dawn’s Awesome Sauce. Thanks, Tess! You’ll have to give me your reviews.